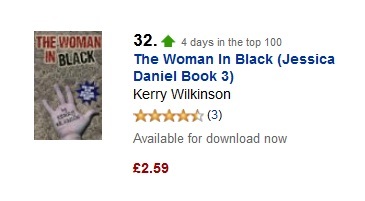 Since its release last week, The Woman In Black has been doing very well. It is currently just outside of the top-30 on Amazon UK. Locked In took around nine weeks to reach the top-100 and establish itself. The Woman In Black did it in approximately 42 hours – with no promotion other than through this site. Popular crime novel review site Crime Fiction Lover has reviewed the book. You can read their verdict here. Thank you to everyone who has bought it. I’ve had some great emails over the past few days. If you want to drop me a line, just click “E-mail me” at the top of this page.